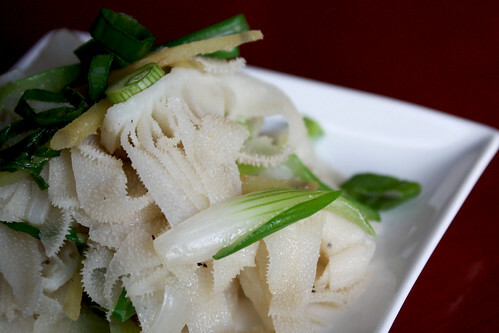 Ginger scallion beef tripe is one of my favorite dim sum dishes. It usually comes in a small dish, and I find it is never enough. I love making tripe at home because I can make and eat as much as I want. 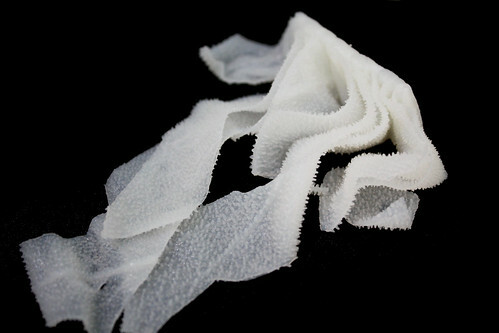 I buy beef tripe from a Chinese butcher, and it is important to find tripe that is cleaned well by the butcher. I usually judge it by its color: the whiter the better. In Ottawa, I get my beef tripe from 168 Market. Beef tripe is the stomach lining of a cow, and is a general term in the sense that it can be from any one of the three stomach compartments. In dim sum, the omasum is used, which is the third compartment of the stomach. The Chinese believe that good food does not need to be masked with strong sauces. Hence, the sauce for this dish is very mild in flavor, and is enhanced ever so slightly using ginger, garlic, and scallions. This is one of those dishes where the texture is just as important as the taste. Good tripe should be tender, yet crunchy at the same time. The biggest challenge for most people is getting past the thin, bumpy textured sheets that dangle from the base of the tripe. Method1. Bring a pot of water to a boil (use enough water to fully immerse the beef tripe). Quickly rinse the beef tripe under cold water, and boil the entire piece of beef tripe in the pot of boiling water for 20 minutes. 2. Drain the water, and run the beef tripe under cold water for a few seconds. Cut the beef tripe in 1/2 inch slices, and set aside in a bowl. 3. Allow the tripe to completely cool and dry. I usually like to cook this over 2 days. I boil the tripe in the evening, and then once it is cooled, I cover it with plastic wrap and throw it in the fridge until I'm ready to cook it the next day. It is best to stir fry the tripe when it is dry. 4. 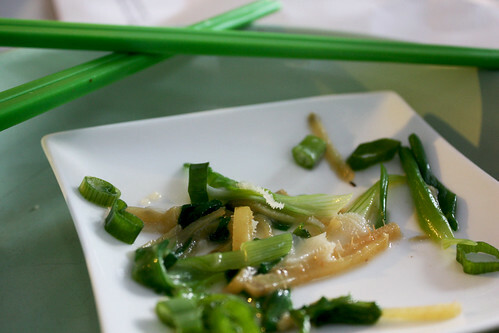 When ready to stir fry the beef tripe, cut the scallions and ginger into matchstick size pieces. Heat oil and garlic in a pan on maximum heat. Be sure not to burn the garlic. Throw in the beef tripe, ginger, salt, sugar and stir fry for about 3-5 minutes. The beef tripe will release water which will form the sauce. 5. Add in the scallions, and stir fry for another 30 seconds. Transfer to a dish and serve. Remember that the texture of the beef tripe should be tender but crunchy at the same time. If you find the sauce too mild, you can always boil the beef tripe in beef or chicken stock. Wow you've posted so much since I last stopped by, and it all looks so delicious! You take awesome pics, what type of camera do you have, if I may ask? 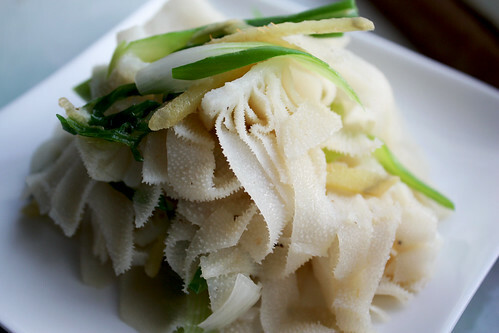 I love Ginger Scallion Beeft Tripe, it is also my fav at Dim Sum. Thanks for the recipe, the pictures look great. I use a Canon Rebel XSI. I believe that is Omasum (Omasa?) not Tripe. lol. it is cow stomach but not the honeycomb tripe we're all mostly accustomed to. Not sure but I thought tripe was a general term for any of the cow's 3 stomach's and omasum refers specifically to the 3rd stomach. Beef Tripe, according to wiki, is made from only one of the first three chambers of the cow's stomach, which includes omasum. If I understood your comment correctly, I don't believe they are two separate and distinct food items. My understanding is that omasum is a type of tripe. When do you add sugar and salt..
What to do with Indian Bitter Melon?